I'm normally not a fan of lavender. There's something about the scent that, outside of spas, makes me run the other way. But all that changed when I came across the Sephora Stimulating Lavender Cuticle Oil. Suddenly, I found myself jonesing for more and more lavender. Everywhere I went, I needed to have this little pen right by my side. I began compulsively applying the lavender-scented gel to my cuticles, sometimes up to three times a day, in the hopes that the scent would calm and soothe my nerves. And you know what? It did. Plus it made my cuticles look a heck of a lot better than they had before, especially with the horrible weather conditions New York has experienced this season. Gone were the ravaged, dry, cracked and peeling cuticles of my past. Here to stay were cuticles so gorgeous, I actually started getting compliments. It's been about a month of serious use with this pen, and I still can't get enough. My cuticles are moisturized and conditioned more than they ever have been, and my hands smell fantastic. What's not to love? 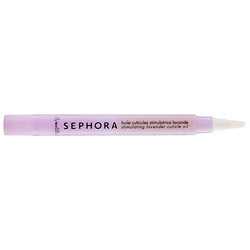 Sephora Stimulating Lavender Cuticle Oil is available for $12 at sephora.com.